Built to last! Double welded ribbed construction stands up to tough use. 18-gauge one-piece welded channel steel apron and understructure fastened to the top every 12". Warp-resistant Novoply™ core. Rounded corners and bullnose vinyl edging all around provide extra protection. Table surface is supported by 1-1/8" O.D., 29"H nonchipping enamel steel tube legs. 9-gauge gravity lock linkage folds legs flush within apron bottom. Walnut top/black edge/beige frame. SELECTED MODELS IN STOCK. Others FOB MISSISSIPPI. 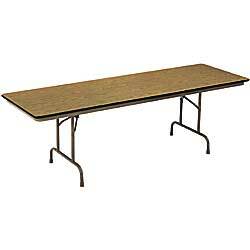 SOLID CORE STANDARD FOLDING TABLES. 3/4" thick, high-density, high-strength solid core top with .022" burn- and mar-resistant high-pressure laminate surface. 5/8" thick particleboard, Decolam low-pressure laminate top. 30% lighter than solid top tables. .083" thick burn- and mar-resistant high-pressure laminate top. XV-1454 59	 60" x 30"
XV-1455 69	 72" x 30"
XV-1456 91	 96" x 30"
XV-1457 77	 72" x 36"
XV-1458 105	 96" x 36"
XV-1449 53	 60" x 30"
XV-1450 62	 72" x 30"
XV-1451 81	 96" x 30"
XV-1452 68	 72" x 36"
XV-1453 93	 96" x 36"
XV-1459 44	 60" x 30"
XV-1460 50	 72" x 30"
XV-1461 65	 96" x 30"
XV-1462 55	 72" x 36"
XV-1463 68	 96" x 36"